Democrats Need a Climate Plan. The Green New Deal Isn’t It. The next time it gains control of the federal government, the Democratic Party is going to need to quickly implement an ambitious program to reduce carbon emissions. So far all the political oxygen on this problem has been sucked up by a slogan, “Green New Deal,” for which a blueprint was unveiled by New York representative Alexandria Ocasio-Cortez and Massachusetts senator Ed Markey. The strategy they have produced is at best grossly undercooked, and at worst fatally misconceived. Enacting an aggressive climate-change policy faces two large obstacles. The first is that every aspect of the policy contains a multitude of knotty technocratic challenges. It entails developing programs to wring carbon emissions out of the power sector, buildings, transportation, agriculture, and changing laws at the federal, state, and local levels. The difficulties faced by the long-developing bullet train in California, a state entirely controlled by Democrats, show how challenging it can be to carry out reforms that require buy-in from lots of stakeholders. The second problem is political. Any national-level response quickly runs into the fact that, even if Democrats gain full control of government in 2021, and even if they abolish the filibuster or find a way to design a bill that can get around it, they will need the votes of moderate or conservative Democrats from fossil-fuel-producing states. The overrepresentation of oil, gas, and coal-producing areas in the Senate helped kill a modest energy tax under Bill Clinton, and a more ambitious cap and trade program under Barack Obama. It would be unfair to expect any plan to solve both obstacles. But the Green New Deal fails to supply useful answers to either problem. On the policy, the Green New Deal simply outlines ambitious targets for carbon reductions, without delving into specifics as to how the targets will be met. In place of detail it offers optimism. Noting that the International Panel on Climate Change proposes to cut global emission by 40 to 60 percent by 2030, and get to net zero by 2050 — which is itself a heroic goal — the Green New Deal proposes the United States get to net zero emissions by 2030. How will the Green New Deal accelerate the already-ambitious objective by two-thirds? It doesn’t say. In place of even broad-brush answers to the trade-offs required by decarbonization, its advocates insist no trade-offs will be necessary a all. 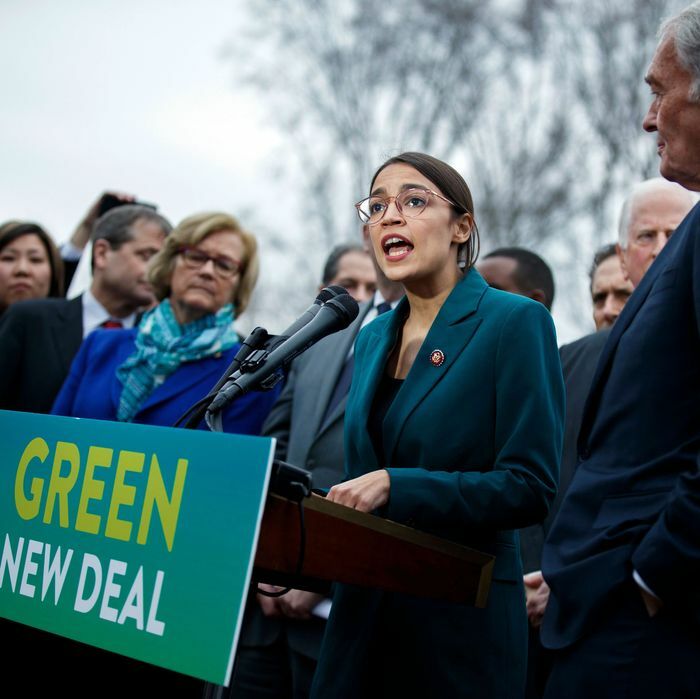 “The question isn’t how will we pay for it,” writes Ocasio-Cortez, “but what is the cost of inaction, and what will we do with our new shared prosperity created by the investments in the Green New Deal.” The Green New Deal’s advocates loftily compare their ambitions to World War II and the moon shot, but these projects were not undertaken on the promise that they would require no sacrifice from anybody. But even as an expression of pure blue-sky idealism, the plan avoids several necessary commitments. It does not include any new construction of nuclear power, and leaves open the possibility of eliminating all nuclear power eventually, despite the fact that any realistic analysis shows zeroing out carbon emissions requires more nuclear power. Likewise, the Green New Deal shies away from any notion of upzoning cities to allow more population density, another vital step. It also avoids committing to a cap or limit on emissions, the omission of which would make it harder for the United States to negotiate emissions limits with other countries. It is difficult to see how the task of finding 218 votes in the House and 50 in the Senate is made any easier by attaching a plan to such goals as economic security for people who are “unwilling to work.” Rather than think creatively about overcoming the formidable obstacles facing the green agenda, the Green New Deal retreats into a political fantasy world in which the ideologically median legislator is Bernie Sanders. While rightly insisting on the primacy of climate change, it betrays its own confidence by submerging climate policy into a broader array of priorities. It simultaneously argues that we must move with urgent speed on climate, but that we must first achieve comprehensive socialism in order to move. Speaker Pelosi received the plan icily. “It will be one of several or maybe many suggestions that we receive,” she said. “The green dream, or whatever they call it, nobody knows what it is, but they’re for it, right?” Her skepticism appears well-taken. Democratic presidential candidates would be well-advised to start over.